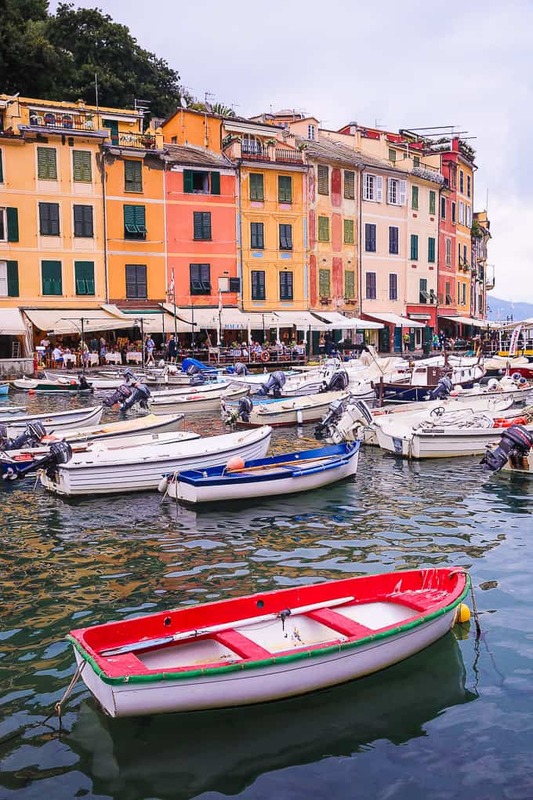 Portofino is a stunning fishing village on the Italian Riviera. Famous for its beautiful harbor and vibrantly colored buildings, it’s one of the most beautiful ports in the Mediterranean! 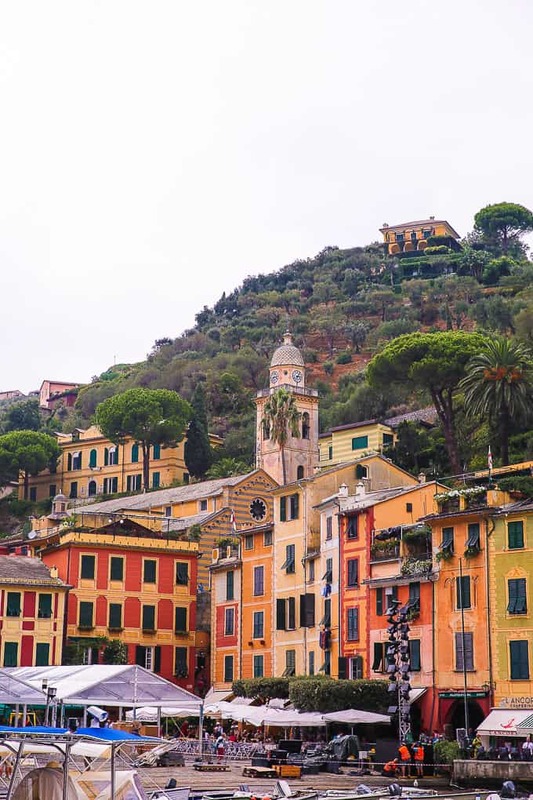 Discover what are the top 5 things you HAVE to do in Portofino, Italy! 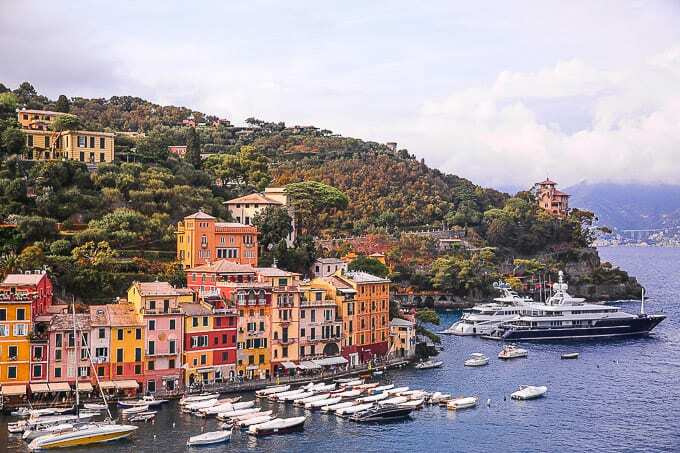 Portofino is famous not only for its stunning views, it is also a popular place for the rich and famous. The place screams WEALTH with million dollar yachts parked at the harbor and high-end shops all around. There are lots of restaurants and cafes, and they are not cheap. 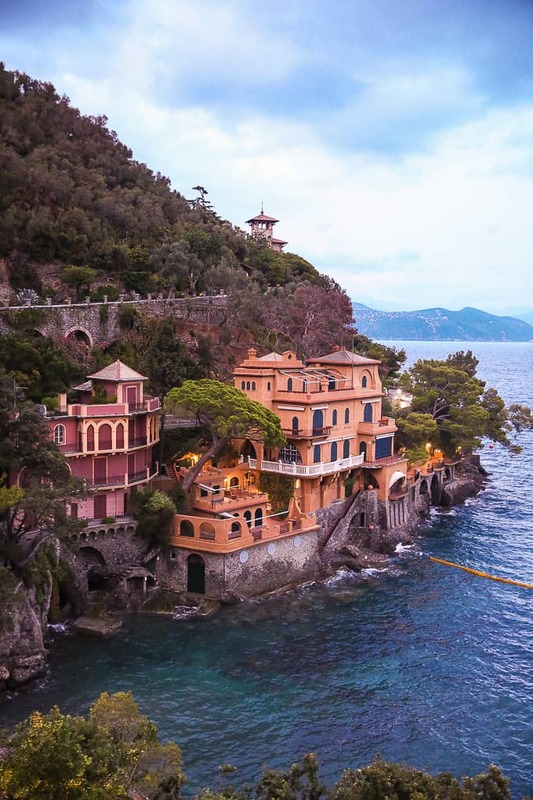 However, Portofino is a spectacular location, and visiting it is totally worth it! 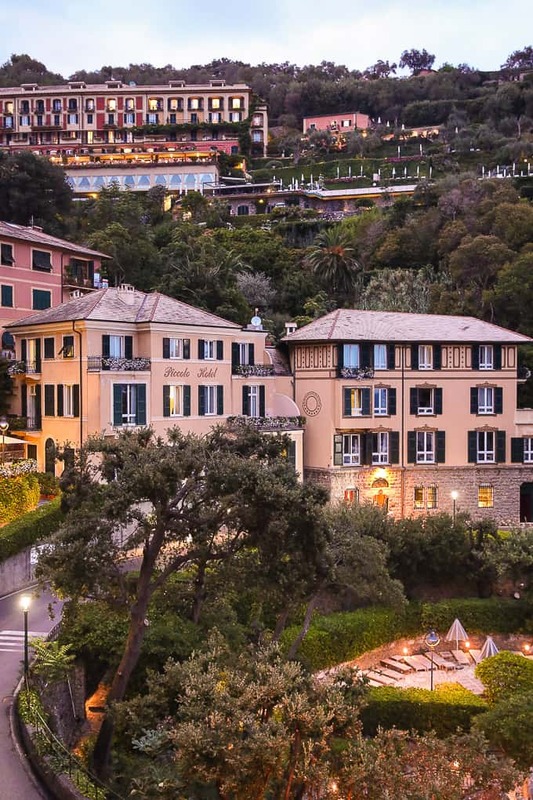 And, the great thing is that you don’t have to spend a fortune to enjoy Portofino for a day. Relax at the cafe in the piazza, eat gelato, and people watch. 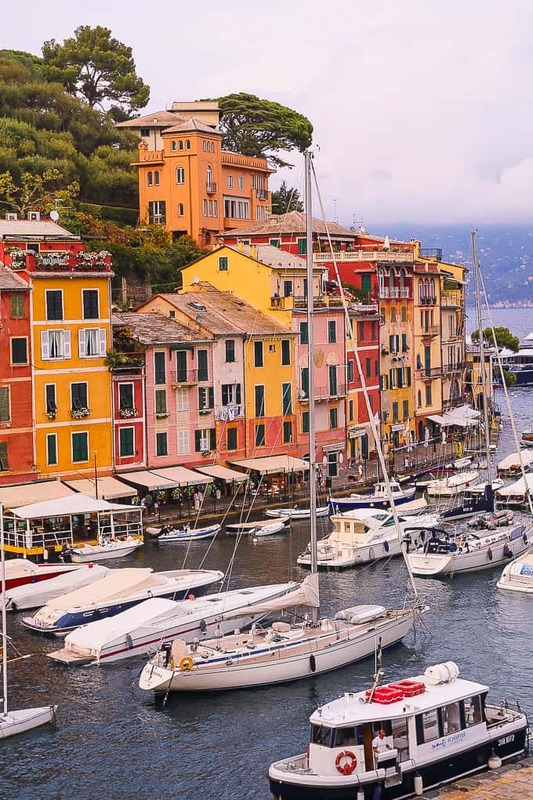 Read on to discover the top 5 things to do in Portofino without breaking the bank! Piazza Martiri Dell’Olivetta is simply the main square (or plaza) right in the harbor of Portofino. This is the famous plaza with colorful buildings situated on the water next to fishing boats and luxurious yachts. This piazza is packed with all kinds of restaurants, cafes, and gelato shops. It’s the center of the village with fishing boats and vibrantly colored buildings. The prices at the restaurants are high, yet the fantastic views are absolutely worth it. You don’t have to spend a fortune – get a drink and a small snack and enjoy the stunning views of Portofino! Or, just walk around – whichever way you look there is a wonderful view for a photo. 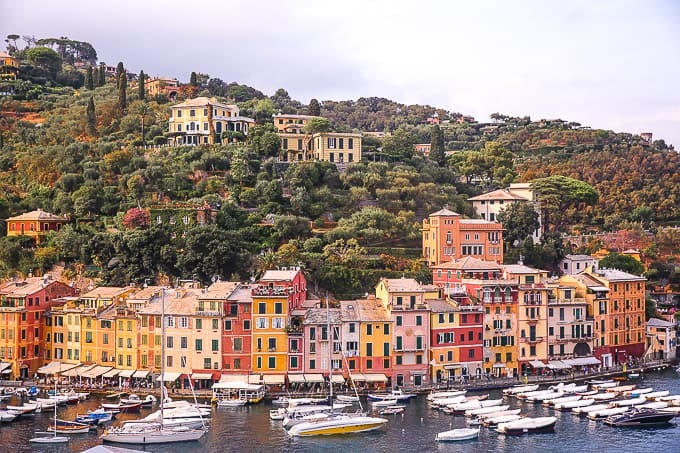 Portofino is the perfect Italian Riviera! The scenery will take your breath away. The picturesque harbor is full of expensive yachts and boats. 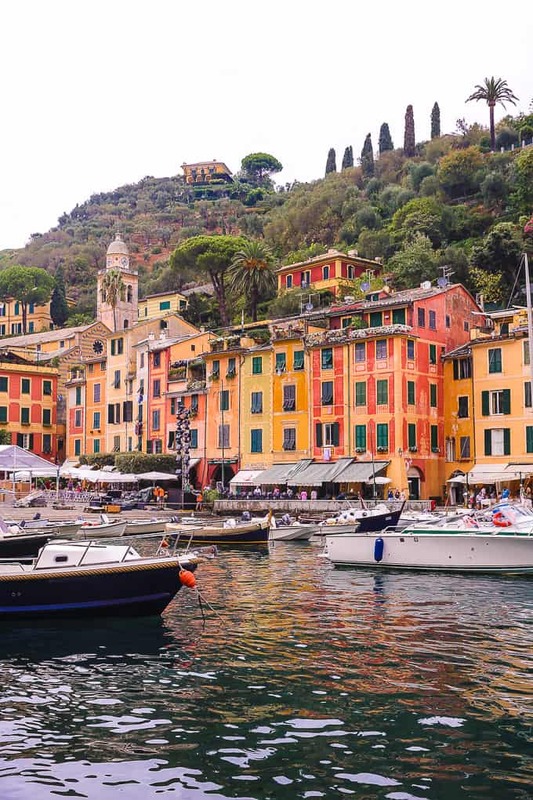 As you walk further into Portofino, away from the main plaza, there are even more restaurants, as well as trendy high-end shops, even a couple of small grocery stores. Explore this visually stunning town! Area Marina Protetta Portofino or The Marine Protected Area of Portofino includes the municipalities of Camogli, Portofino and Santa Margherita Ligure. The area is famous for its cliffs and beautiful little inlets. Take a boat trip to get the best views of the scenery, to see the villas and the houses on cliffs and the beautiful shoreline. You can also take the red carpet trail from Portofino to Santa Margherita. It’s a well-marked walking trail that is about 5 km. It takes about 1 hour to walk between Portofino and Santa Margherita using this trail. On the way, you will see turquoise blue water, beautiful houses perched on cliffs, and multi-colored buildings lining the seaside. San Martino Church dates back to the 12th century. It’s built in a Romanesque style. San Martino Church is situated on an opposite hill across the harbor from the Church of San Giorgio. The church is perched on the hill, close to the main plaza. The facade of San Martino Church is visible from many points in Portofino. The church has an impressive interior with stained glass windows and ceiling paintings. The interior is decorated with colorful paintings, mosaics, and statues. 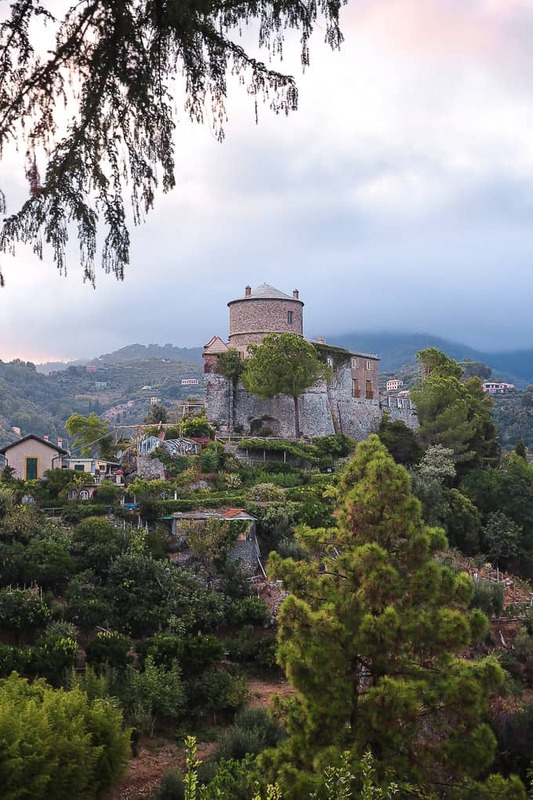 Do not miss the walk to the beautiful Church of San Giorgio on the hill. It’s only a short walk up the hill from the main plaza. The views from this spot are amazing! 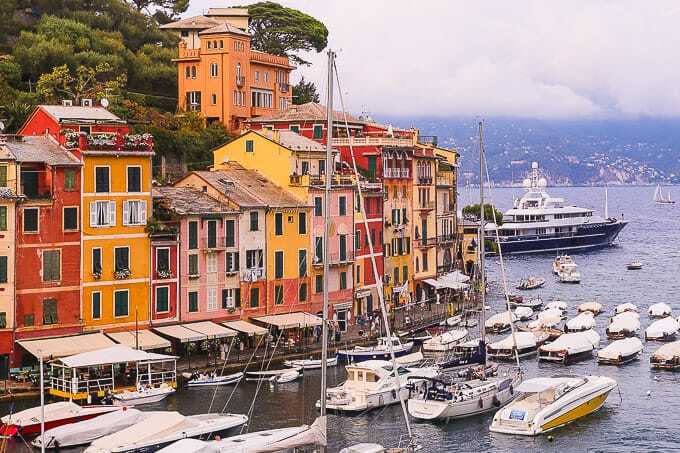 There is a beautiful harbor of Portofino on one side, and the fantastic view of the Mediterranean sea on the other. Church of San Giorgio is a small Catholic church built in the 1150’s. The church was completely destroyed during World War II, and rebuilt in 1950’s. 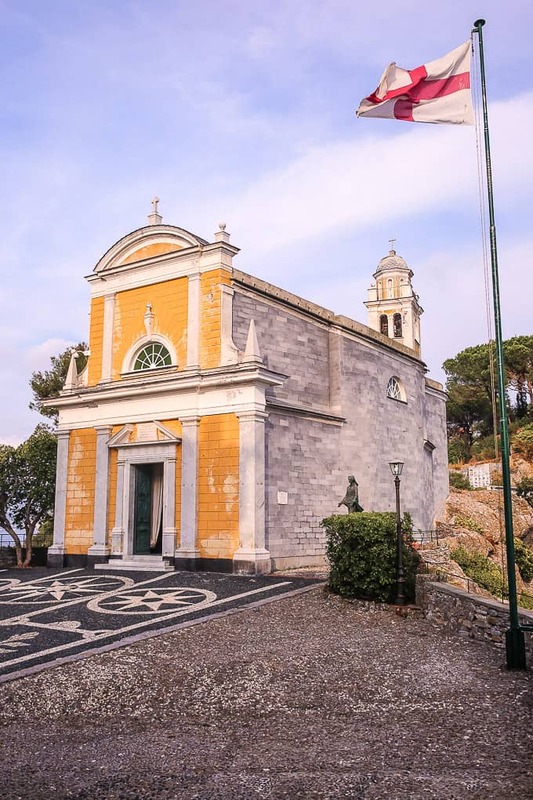 The Church of San Giorgio is located on an opposite hill across the harbor from the San Martino Church. 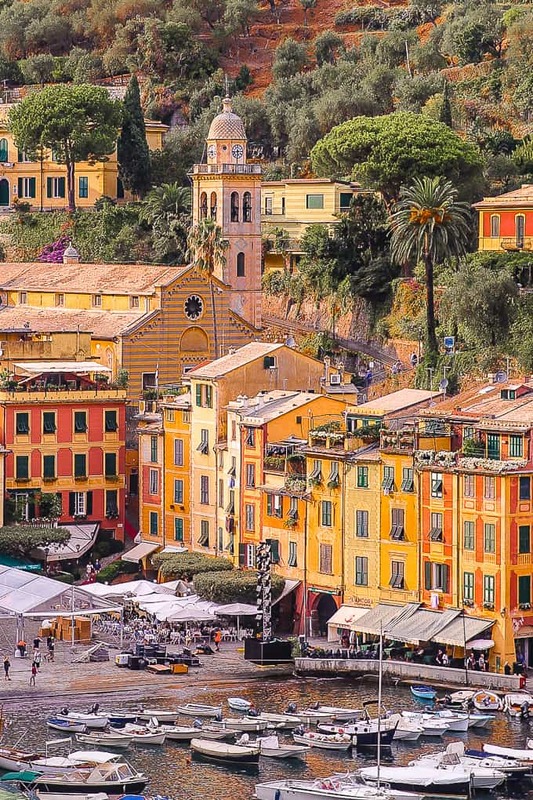 If you’re looking for a great view or photo of Portofino, hike up a small hill from the main Piazza in Portofino to the Church of San Giorgio. This church is on the way to Castello Brown. Castello Brown was originally built as a fortress in the 16th century. History of the name: in 1867 the castle was purchased by Montague Yeats Brown, English Counsel in Genoa. He and his descendants owned the property from 1867 to 1949. 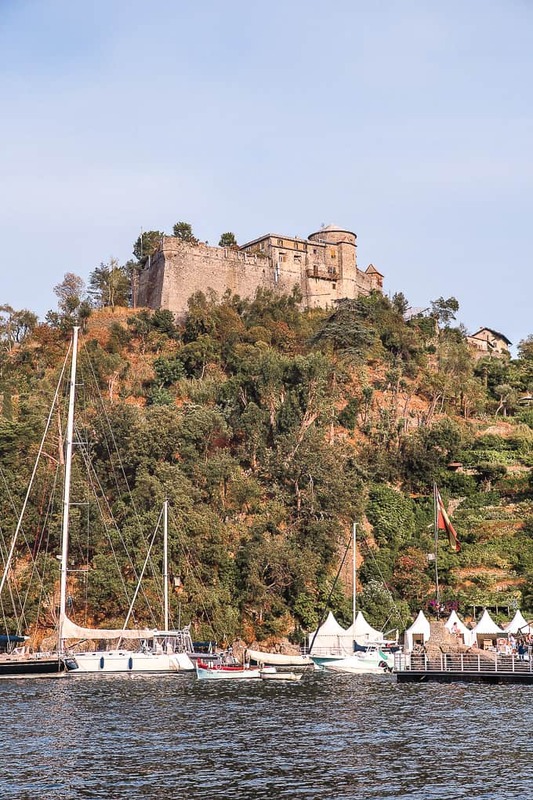 The castle itself is visible from the main plaza in Portofino, and it’s really fun to walk up to the castle and appreciate the stunning views overlooking Portofino along the way. The way to the castle leads through impressive natural beauty and greenery. It’s a steep walk up the hill, but the views are worth it! Do not attempt to drive your car directly to Portofino. The town is very small, and most likely your car will not be allowed. 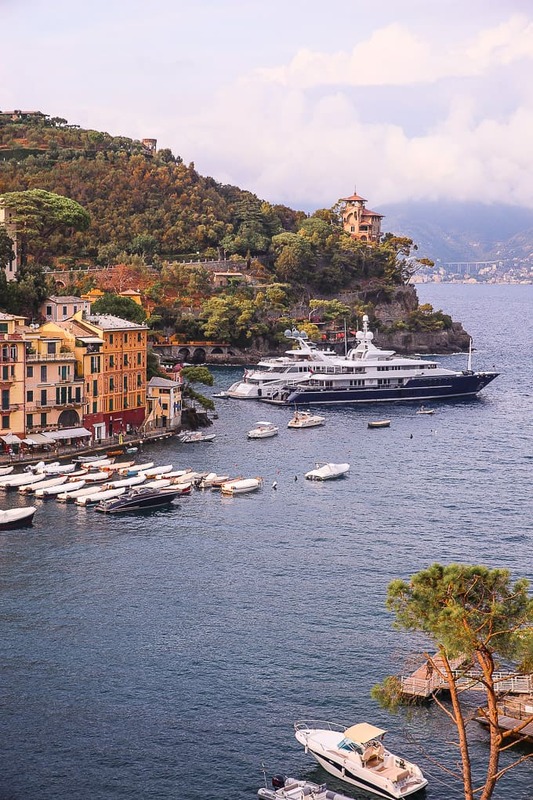 The best way to get to Portofino is to start at the neighboring town of Santa Margherita and take a boat, ride a bus, or simply walk! 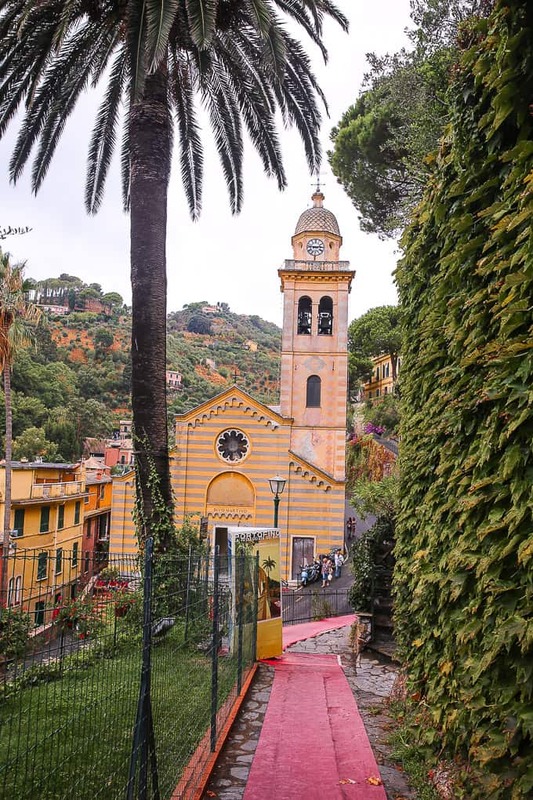 My favorite way to get to Portofino is to walk a beautiful trail from Santa Margherita. By boat. 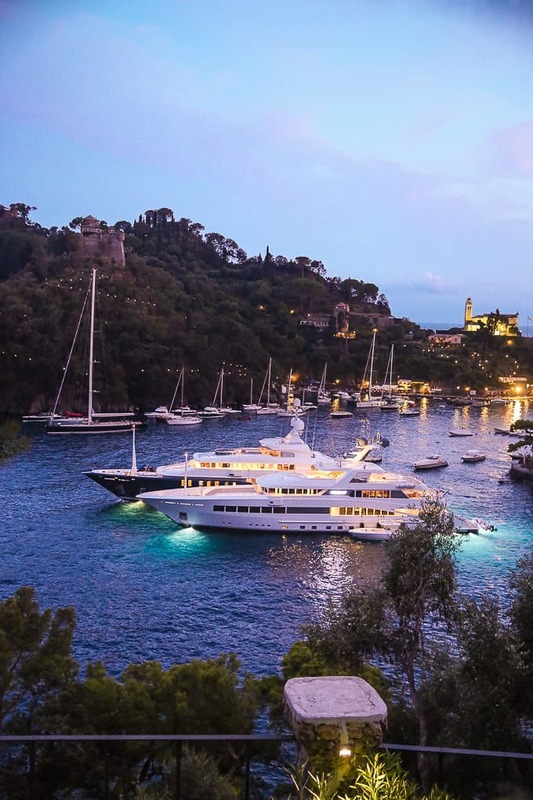 Take a boat from Santa Margherita to Portofino. The views are amazing on the boat ride. By bus. The bus ride from Santa Margherita to Portofino takes about 15 minutes. Walk from Santa Margherita to Portofino on red carpet trail. 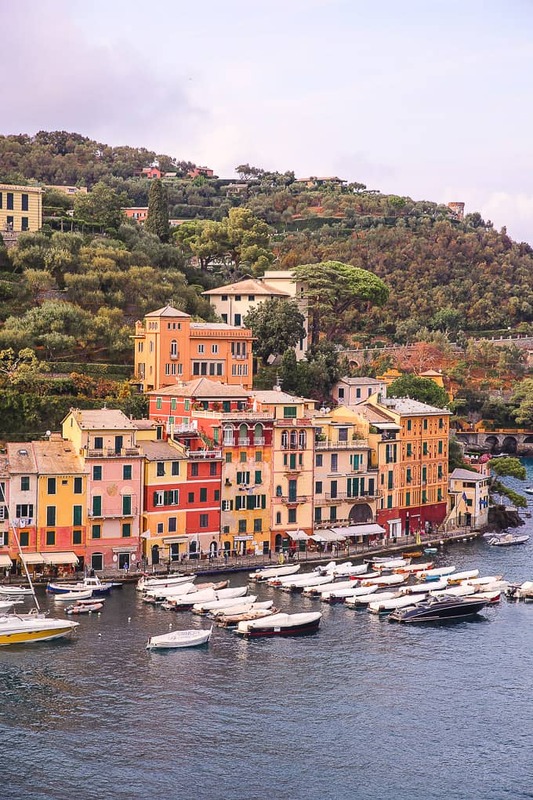 Drive to Santa Margherita, park the car, and then take a beautiful walking trail to Portofino. The red carpet trail is about 5 km. 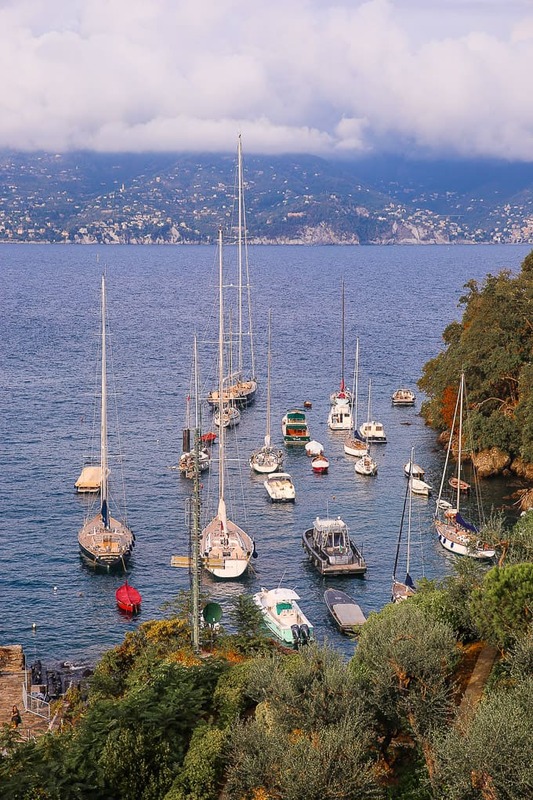 It’s a pleasant walk that takes less than 1 hour to get to Portofino from Santa Margherita. This is my favorite way to get to Portofino. It’s a great experience to walk leisurely surrounded by beautiful views and to get a bit of exercise before arriving at luxurious Portofino.